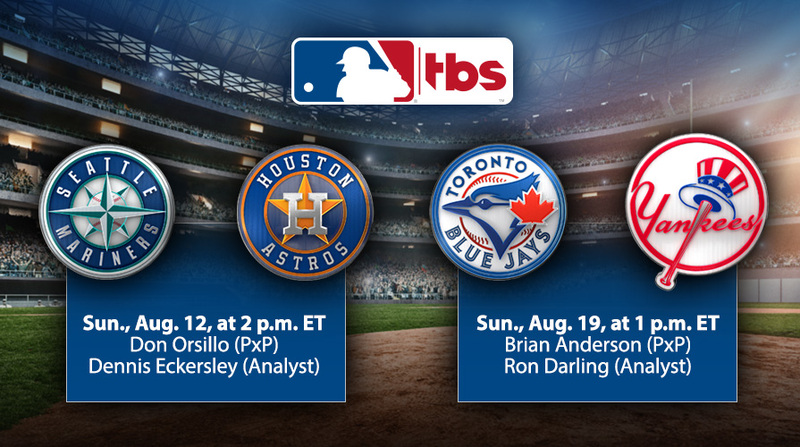 MLB on TBS weekly game coverage will present a full national telecast of an American League West battle – the defending World Series Champion Houston Astros hosting the Wild Card-contending Seattle Mariners – Sunday, Aug. 12, at 2 p.m. ET. Don Orsillo and Dennis Eckersley will provide commentary for the telecast. American League East rivals will meet the following weekend – Toronto Blue Jays vs. New York Yankees – Sunday, Aug. 19, at 1 p.m. ET. Play-by-play announcer Brian Anderson will be joined by analyst Ron Darling to call the game, which will not be available locally in the New York market. The network's upcoming live game schedule and telecast notes follow.